Alice did not actually "open" her Christmas presents from me and Larry. We assembled her new toys and just let her explore them. 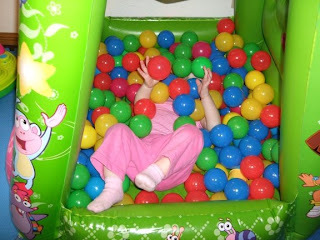 One of her new presents was a ball pit. 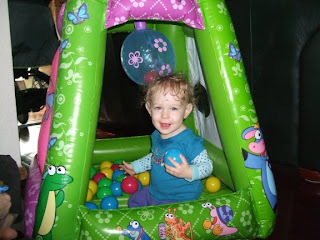 The ball pit only came with 50 balls, which was pretty lame - not enough to even cover the bottom of the pit, so we bought 175 more - THIS is what MADE the pit. 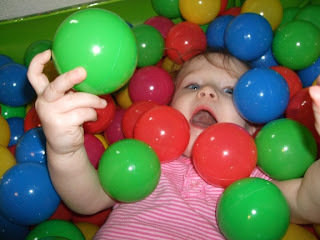 Add balls - instant fun! Two sides of the pit are open, but the other two sides are closed. One closed side has holes in it to stuff the balls. 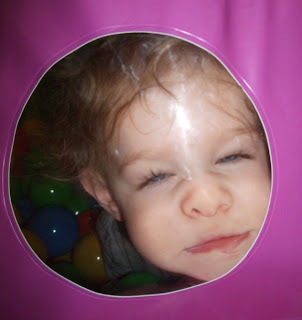 The other side has 3 plastic "windows"
Alice loves to smash her cute little face into the plastic windows, which gives us a good laugh.